Virtual Travel & Island Guide about Medical Care, the Clinics, Security & the Malaria situation on Ko Chang in Thailand. According to The World Health Organisation, Thailand is listed as a category-C-country, but for travellers and holiday-makers only a very small risk exists. Therefore only the border areas to Cambodia and Laos apply. The south and Bangkok are considered malaria-free. German travel guides advise against using chemical malaria prophylaxis, while English travel guides endorse these. Many of the Mosquitoes that transfer the malarial parasite, are meanwhile resistant to most of the prophylaxis medicines. Other protection (mosquito-lattice on the windows and doors and/or mosquito-nets) is recommended. Bright clothes, long trousers, long-armed shirts and if necessary mosquito-repellent for the skin also helps prevention. Mosquito-coils (smoking spirals, available in all supermarkets) reduce the risk to be stung as well, however spread a rather unpleasant smell. Mosquito-repellent for skin application is likewise available everywhere. At the beginning of the nineties malaria was still spread all over Ko Chang. Many of the island-inhabitants were infected with the malaria virus. Since then anti-malaria-chemicals were sprayed regularly everywhere over the island. As a local hotel-owner informed us in the spring 2004, Ko Chang is apparently malaria-free while on Ko Kood and the other islands around Ko Chang, malaria still occurs. If you should choose to use prophylaxis, consult your family doctor or contact a Tropical-Institute in advance. If suffering from a non-clarified fever after your stay in Thailand, you should be examined for Malaria. The first symptoms resemble those of a flu infection and are often misjudged. Even mild fever and headaches can be signs of possible malarial infections. We point out that the information about the malaria-situation on Ko Chang neither comes from a malaria-specialist nor from a doctor. The decision pro/contra malaria-prophylaxis must be made by yourself. In the case of doubt better contact a specialist or a tropical-institute before you start your Ko Chang holiday. There you will get more elaborate information, also about the side-effects of the individual preparations. If you want to stay longer on Ko Chang, these side-effects should be included into your decision whether to take malaria-prophylaxes or not! In many villages on the island you will also find quite well equipped pharmacies. There is also a clinic and a small malaria clinic in Laem Ngop, where you can be tested for malaria. Opening-hours: Mon - Fri 8.30am - 12.00 am and 1.00 am - 4.30 am. 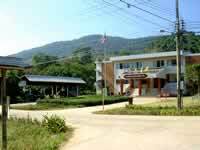 In Trat are 2 hospitals, the national Trat-Hospital (039/51 10 40/1) and the private Bangkok-Trat-Hospital (039/53 27 35). For more Information about health and health-risks in Thailand, click here: Thailand Information / ... Infrastructure & Health, Risks & Malaria in Thailand. Although thefts occur only rarely, it is advisable on Ko Chang like everywhere else to secure ones accommodation when going out. If necessary there are police posts in many of the villages on Ko Chang. The headquarters are located at the east coast in Baan Khlong Nonsi and can be contacted by telephone on 039/58 61 91 or 039/58 61 20. 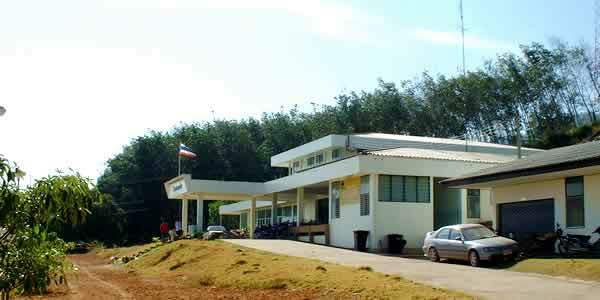 Since end of 2006 there is a tourist police office on Ko Chang, located directly at the Kai Bae Beach viewpoint. Coming from north you will find it up the hill on the right hand site. Another office of the tourist police is situated in Trat and can be contacted on 1155. The police in Trat can be contacted on 039/51 10 35.